Who else will star in Super Smash Bros. Ultimate, a game that’s already been announced to feature every previous Smash character along with a handful of newcomers? A brand new “leak”—one that’s completely unverified and in fact likely to be fake—is polarising the Smash community and has led to non-stop drama over the past week. Rosters are a big deal in any fighting game, especially the Smash series, which has been slowly adding bigger and weirder names with each new entry, from Street Fighter’s Ryu to Final Fantasy VII’s Cloud Strife. With every new Smash game there are also new rumours, ranging from dead-on accurate (a 2014 leak revealed the entirety of Smash 4’s roster) to completely absurd. The newest rumour, which promises the additions of Banjo Kazooie and Geno from Super Mario RPG, is far closer to the latter, but it has still led to turmoil among Nintendo fans. While some immediately latched onto it as gospel, others dismissed it as another false lead. These camps soon evolved into #teamreal and #teamfake, with pitched debates raging across places like Reddit, ResetERA, and GameFAQs that only Nintendo can resolve. And many are hopeful the company will do just that, offering official answers during its dedicated Smash Bros. Direct scheduled for Thursday at 2pm. The alternative would be a fan community already on the edge left to descend even deeper into outlandish conspiracy theories. It started on 24 October, when images, originally from Snapchat video, began circulating online. They appeared to be of marketing materials for Smash Bros. Ultimate, and included a thin, long piece of banner art with every character currently revealed as well as some previously not. In a ResetEra thread, fans started deciphering the image, outlining apparently new characters by contrasting the banner art with previous versions. They believed they’d found was likes of Rare’s Banjo Kazooie and Golden Sun’s Isaac. At first blush, the names appeared to be just random and yet reasonable enough to be convincing. There was circumstantial evidence that appeared to lend credence to the leak, including the existence of a promotional image for the new Grinch movie in the folder of marketing materials. The rumour then became known as “The Grinch” leak, with its most stalwart believers arguing that the Grinch image was different from all of the existing promotional art such that if someone had faked the leak, they would have had to have created a unique piece of Grinch art in the process. 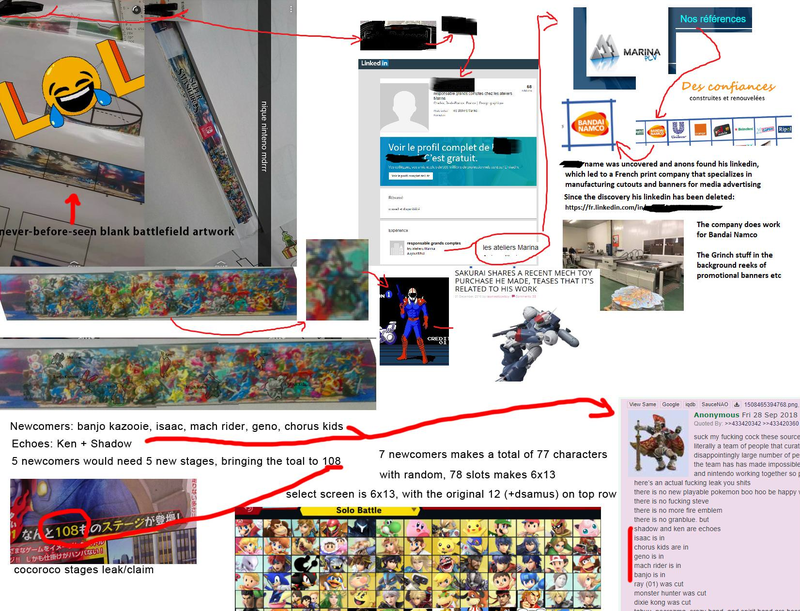 In addition, the leaked banner art appeared to fit in line with the evolving nature of Nintendo’s own Smash Bros. banner art, in which characters moved around to make room for newly revealed ones in a seemingly pre-planned pattern. Nintendo’s last Direct had to initially be delayed due to an earthquake in Japan. During that Direct, Nintendo revealed that Animal Crossing’s Isabelle would join the new Smash, and when changing the banner art to reflect that, someone at Nintendo cropped part of Little Mac’s hand, leading to speculation that there was another character meant to be there who might have been cut during the earthquake. Golden Sun’s Isaac might use an earthquake attack. Could Nintendo have removed him from the banner at the last minute, forgetting to restore Little Mac’s hand in the process? Less tinfoil hat and more straightforward was the existence of a blacked out name in the top left of the image. 4chan posters claimed to trace it back to the LinkedIn profile of a person who had done work at a French marketing firm called Marina PLV. On its website, the company listed Bandai Namco, the company developing Smash Bros. Ultimate in collaboration with Nintendo, as one of its clients. People assumed the existence of random Grinch promo must mean the company was similarly working for Universal in someway.. Elsewhere in the leak was an image alleging to show one of the new game’s levels without any characters on it that hadn’t previously been released. Basically, if the Grinch leak was a hoax, it was a seemingly incredibly elaborate one. By the end of the day, others were questioning that premise. At 10 p.m. Wednesday night, artist Vaanrose went into detail analysing apparent discrepancies between the background art in the leaked banner image and the background art from the official art. Some clouds were different shapes, others were missing, and certain shadows and highlights didn’t seem to match up. YouTuber Artsy Omni, who in 2015 faked a leak of Rayman being in added to Smash Bros. Wii U, then made a video following Vaanrose’s tweet supporting the latter’s analysis, convincing some people that the leak was sloppier than they’d originally thought. And of course, there was the general lack of any proof or strong corroborating evidence for the leak that existed independent of it. 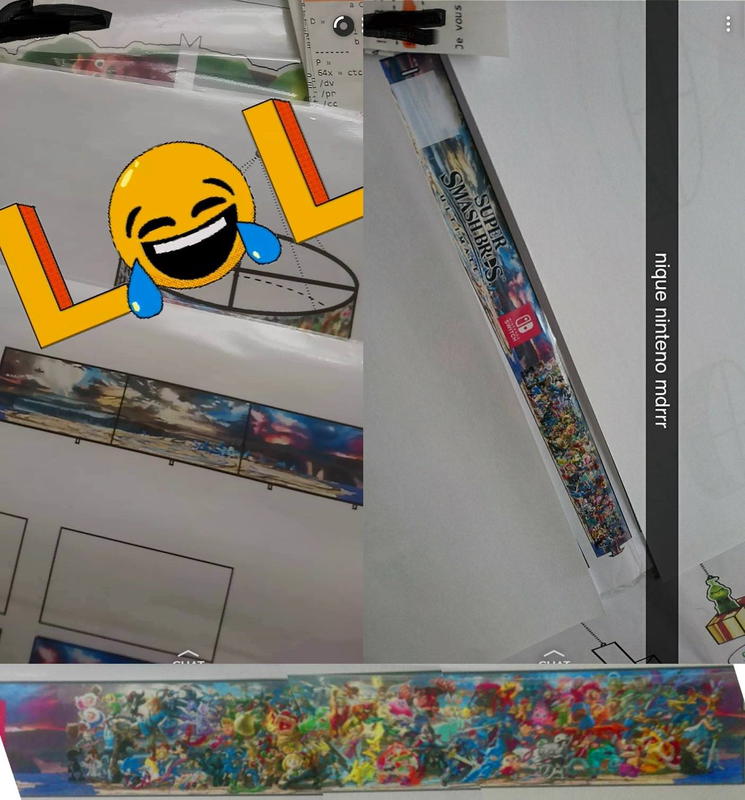 In a long Twitter thread, user NantenGex argued that the the images weren’t any harder to fake than most of the game’s fan art going around, and argued that it was suspicious that the person in the original Snapchat who allegedly leaked the images didn’t do a better job of trying to protect their friend’s identity so that it couldn’t easily be traced back to a public LinkedIn profile. Others felt the pieces had fallen into place just a little too easily. Some argued that the blurred art for the allegedly new characters looked similar to mockups by a Smash fan artist called Pepy. On 25 October on Facebook, Marina PVL, the French marketing company associated with the leak, posted that while the individual in the leak did at one point work for them, they had left in 2016, and though the company did work with Namco Bandai, it wasn’t on anything related to Smash Bros.
On 27 October, Emily Rogers, someone who has shared Nintendo leaks in the past, said on Twitter, “I wouldn’t buy what that Grinch leak is selling.” Since Rogers, a long time Nintendo rumour insider, had claimed last February that Nintendo would be releasing a Smash Bros. game later in the year, weeks before Nintendo announced Smash Bros. Ultimate in its March Direct, her dismissal carried weight. Teamfake felt bolstered, and the line between the two sides became clear. But then things got somehow weirder, with someone citing a picture of the Grinch on top of a folder at the Nintendo booth at Comic Con London and posting a video of it to the Smash subreddit. Some read this as an unlikely vindication of the original leak, while others assumed it was just somebody trolling a fan community at its most gullible. The worst thing that could happen is if somehow Nintendo spends all of Thursday’s Direct focusing mostly on other Smash Bros. Ultimate unknowns, like its new single player mode, believed by some to be called “Spirits” and to revolve around the ghosts of Smash characters in some way. If Nintendo somehow spends 40 minutes answering every question about the upcoming game except who the final characters will be, the Smash community might not make it to the game’s 7 December release.